The Georgian Shepherd is an Aboriginal dog from the Georgian mountains in the Caucasus. It is an ancient working breed from Georgia.The Georgian shepherd is related to the Caucasian Shepherd Dog and the Russian "Caucasian Ovcharka". There are two kinds of Georgian mountain dog: short haired kazbegian dog called "Nagazi"; long haired Georgian mountain dog. The shorter coated Georgian Mounatian Dog is an ancient working breed from Georgia. As one of the giant dog breed, Georgian shepherds are some of the biggest dogs on the planet. Because of their stature, Georgian shepherds fall into the Molosser category. Male Georgian mountain dogs grow between 75-85 centimeters in height, and 65-85 kilograms in weight. Physically, these dogs are strongly-boned, muscular, and athletic, with a large head and powerful legs. Georgian mountain dogs tend to be assertive, brave, and alert. Shepherds traditionally used Georgian mountain dogs for defending sheep from predators. It is not suitable for apartment life. Georgians were calling this dog "Nagazi". It has been used as a sheep guard dog for centuries. The breed is extremely popular in Georgia. The Cynological Federation of Georgia has had a strict battle with the Russian federation of Cynologs about Caucasian Shepherd dog. In 2012, the International Cynological Federation will decide which national breed is the Caucasian Shepherd Dog as a result of this heated discussion. After removing most of the Georgian nagazi from Georgia, Georgian enthusiasts with support from the Ministry of Environment began expeditions to the regions of Georgia to describe and take photos of the remaining Georgian shepherds. Georgia started advertising the breed using television broadcasting and printing articles about Georgian shepherds in order to popularize the breed. After the soviet collapse, Georgia began once more to popularize this dog. 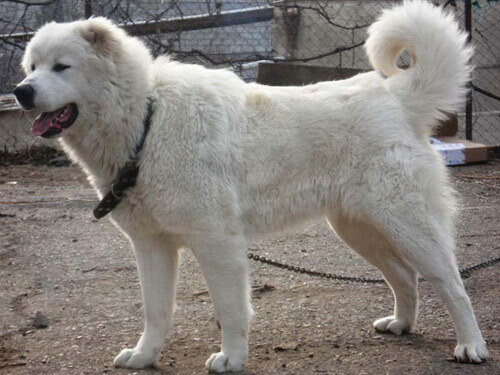 Today the Georgian main goal is to breed Georgia's ancient white shepherds (also other Georgian shepherds) which are rare. Unfortunately, Georgian shepherds are still used in dog fighting.